I just finished Tricia Goyer's newest book, Beside Still Waters . Marianna's family is talking of moving to Montana, a plan she does not want, especially with the promise of a life in Indiana with the boy she (thinks she) loves. However, she has always tried to be the 'perfect' daughter, so she agrees to travel with her family, but plans to stay in Montana for only six months. But, the more Marianna learns in Montana, the more she wonders if she can go back to what she always knew. Although Tricia has jumped on the Amish band wagon that seems to be flooding the Christian Fiction market, Beside Still Waters wasn't exactly your typical Amish book. It appeared that Marianna's father and uncle were seeking and open for the truth of God's Word, and that Ben was going to share it. I know many people think the Amish are godly...but, most, if not all, are not saved. They believe good works get you to heaven. This belief seemed evident in the book, and yet Tricia stopped just short of sharing the gospel - true salvation. That disappointed me. Also, the ending was a bit stilted. Marianna was so set on going back to Indiana, but in a short conversation, she was hopping off the train. 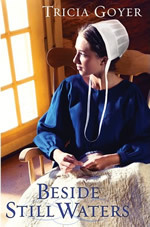 Although the Amish genre is beginning to feel a bit overdone to me, Beside Still Waters was good overall, because Tricia had a fresh and different angle from the average Amish subject matter. Perhaps Tricia will write a sequel to see what happens in this small Montana community, especially because of the not-quite-satisfactory ending! That's what I thought! Click HERE to see what others are saying about Tricia's newest book! Many thanks to Tricia and Litfuse for sending me Beside Still Waters to read and review! Tricia is hosting a giveaway on her blog! She'll be giving away 10 copies of Besides Still Waters as well as some other prizes! Hop on over and ENTER!